If you are passionate about education and want to make a difference in the lives of young students, earning an associate degree in education online can start you on the path toward teaching at the K-12 level. Educators interact with students everyday, helping them learn and discover the world around them. Not only is teaching a meaningful career, it also offers a flexible schedule, with school hours ending mid-afternoon and summer breaks spanning several months. However, teachers do spend extra time in the evening preparing lessons and grading papers, and some teachers also teach courses during the summer months. Earning an associate degree in education online allows you to explore the coursework and theories behind teaching with minimal financial and time commitments. You can take your classes from home, which allows the flexibility needed to continue working at the same time. After you graduate with your associate degree in education online, you can get a job as a teacher’s assistant, tutor, or nanny, and as a preschool teacher at some schools. To pursue a career as a certified, full-time teacher, you will need to transfer to a four-year bachelor’s degree program in education. 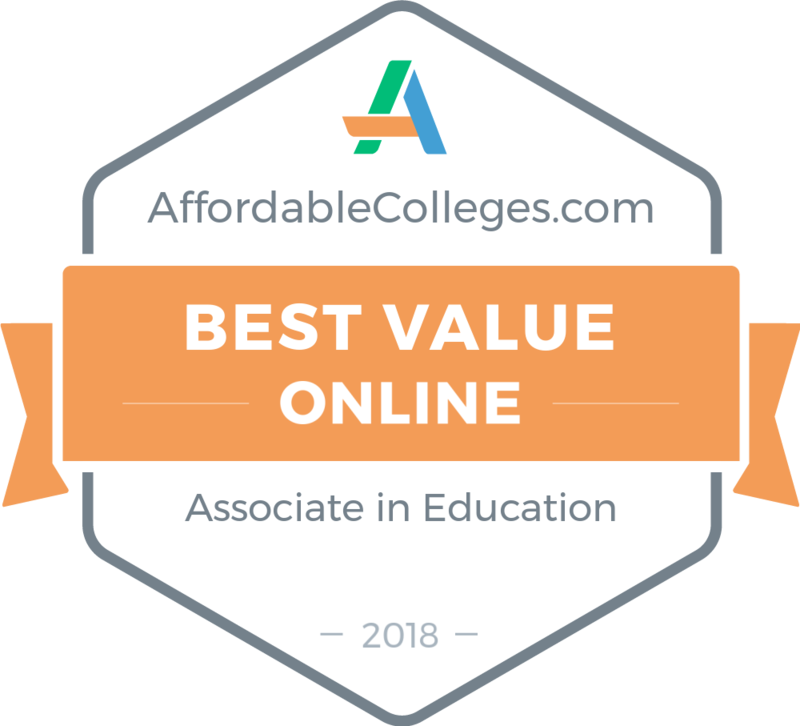 We ranked the most affordable online associate degree in education programs below. These programs will allow you to pursue your career goals, no matter how much money is in your savings account. ACCC's institutional philosophy is based on the belief that learning and self-improvement is a continuous process. The college is dedicated to providing higher education that fits individuals regardless of where they are in life, including cheap online associate degrees in education. Allen's remote programs, focused on either early childhood or elementary education, allow students to earn their degree or certificate completely online. Bolstered by a variety of resources -- such as 24-hour technology support, tutoring and writing help via email, and an affordable textbook rental system built into the general tuition -- online students get the support they need to be successful. Furthermore, online students are eligible for the same scholarships, grants, and loans through FAFSA as their residential counterparts. With roughly 60% of Allen students enrolled in online coursework and 90% of that population recommending it highly, there is no better time to join this accomplished and affordable learning community. Established in 1973 as a comprehensive community college providing education ranging from vocational training to the liberal arts, Northeast's main campus is located in Norfolk, Nebraska. NCC's pedagogical values include fostering applied research and technological prowess as well as a commitment to public service, including continuing education and community development. Northeast offers a variety of programs, including an associate degree in education online through an easy-to-use platform. Students are able to access learning materials, read instructor announcements, discuss content, and submit their work wherever they live. Though out-of-state students must pay a higher tuition rate than Nebraska residents, online programs do not cost more than residential programs. Furthermore, remote students have access to the same support services as their traditional counterparts, including career advice, personal and academic counseling, and academic support through tutoring and the Writers' Clinic. As stated in NCC's strategic plan, Vision 2020, the online program will continue to be a priority for the institution. Servicing Odessa, Texas and the surrounding areas, this community college offers continuing education courses and two-year associate degree programs. Based in a predominantly rural area of West Texas, Odessa services 13 counties. Due to the composition of the student population, Odessa's institutional values are based in vocational education, transferable credits for students seeking to extend their college career to a four-year plan, and adult continuing education courses. Students pursuing an online associate degree in education can fulfill course requirements through Odessa's ed2go portal. These courses are also suited for individuals seeking specific career training or those interested in a certain topic, such as "Real Estate Law" or "Teaching Students with ADHD." Online tuition is a flat rate, usually $99.00 for a 24-hour seminar. Additionally, Odessa College offers other perks for its students, including a "First Course is Free" policy for new students and a tuition discount for students who complete a certain amount of credit hours at Odessa with a 2.0 or above GPA. With several campuses across the city, BCCC is dedicated to providing quality, affordable, and accessible educational opportunities for its students. Originally founded in 1947, the school now offers several programs that can be completed either remotely or in conjunction with traditional courses, including cheap online associate degrees in education. By the school's definition, the content of these courses must be at least 80% remote; certain classes do require students to take tests on campus for verification purposes. Online courses are facilitated through the Canvas platform and, as the college states, are usually more difficult than those taught in a conventional classroom. BCCC recommends e-learning for mature and dedicated students and offers support such as NetTutor, an online tutoring service, to help them succeed. Financial aid is available for eligible students, and there are special accommodations for military veterans. Tulsa Community College has served the city and northeastern Oklahoma since 1970 and is the largest institution of its kind in the state. The college identifies integrity and quality as the cornerstones of its educational philosophy, and its mission is to provide quality, flexible, and affordable education that responds to a dynamic global environment for all students. Tulsa offers one of the most affordable online associate degrees in education in the country. Courses within these programs can be completed entirely online, facilitated through Blackboard, or through a mixture of online and classroom components. A support network helps remote students with everything from tutoring to tech support. Students can apply for a variety of state scholarships, including Oklahoma's Promise, an award for students from families whose net income sits below $50,000. Founded in 1946, Navarro College fosters diversity in its students, accountability in its actions and the actions of its students, and innovation in its teaching methods and accessibility. Navarro also prides itself in its affordable tuition. At $126.00 per credit and cumulatively less expensive the more credits a student takes, the cost is roughly half that of a four-year college. Navarro offers a number of online associate degrees, including a hybrid elementary education program, with remote and classroom-based elements. Financial aid and counseling is available to all students, but it should be stated that due to Navarro's accreditation system, distance learning is not available to non-residents. However, those who are eligible will find that Navarro is part of the Virtual College of Texas consortium, which allows its students to take online courses at any of the participating community colleges while remaining part of the Navarro community. Hagerstown was founded in 1946 and is Maryland's first community college. The school's mission focuses on education that facilitates university transfer, career entry or advancement, and skill enhancement, including adult continuing education. Facilitated through Moodle, HCC offers four completely remote programs, including one of the nation's most affordable online associate degrees in education, and nine hybrid ones. Coursework is designed to transfer seamlessly to a four-year college, and graduates can be sure that they are well-equipped to pursue a bachelor's degree. Financial aid is available, and approximately three out of four students receive some form of funding, whether it be a Pell Grant or a number of state and private scholarships. Touting a mission of comprehensive student-centered education, career mobility, and sustainable community development, WMCC is a great choice for those looking for an affordable and connected online associate degree. Located in Berlin, New Hampshire, WMCC offers completely remote programs in accounting, business administration, criminal justice, and health and wellness facilitation. Those looking to obtain an associate degree in education online have the option to complete most coursework from the comfort of their home. Online students have access to tutoring through the Smartthinking platform as well as the same digital library privileges as their traditional counterparts. Though you'll still need to adhere to course deadlines, students have the option to complete discussions and assignments asynchronously. WMCC's 100% online programs are accredited by the New England Association of Schools and the Colleges Commision on Higher Education. Additionally, the institution is part of New Hampshire's Dual Admission Program, allowing them to simultaneously work on their associate and bachelor's degrees. WMCCC graduates can seamlessly transition into one of four participating state universities if they earn a minimum of a 2.5 GPA and at least a C in every class. First established in Statesville, North Carolina as a women's school, Mitchell Community College welcomed men onto its campus during the Great Depression. Mitchell now offers a number of associate programs, including degrees in health sciences, engineering and construction, and public safety. Though no degree at Mitchell can be earned entirely online, much of the coursework can be fulfilled through the school's ed2go platform. This online system is also suitable for adults looking to obtain new knowledge and skills or for those looking to finish their general education work as they prepare to pursue their associate degree in education online. High school juniors and seniors with a 3.0 or higher GPA may be interested to know that Mitchell is part of the Career and College Transfer Pathways system, which allows participants to earn up to 41 hours of college-level credit for free. A parallel program is also available for high school students interested in gaining career and technical skills.